North of the Fence is back with coverage of everything from National City to the border. First and foremost — Watch for clown sightings in the South Bay! Susana Maza applied for a permit to add two refrigerator doors of beer and wine to her small market, Gama Produce. In August, she submitted a letter to National City’s gov’t offices. The letter said the city’s vice mayor, Jerry Cano, came to her store on July 30th and told her the council was not going to approve her liquor permit. Jerry Cano, who is running for re-election, strongly denies the accusations. He says the conversation never took place. He apparently is also considering filing a complaint against Maza and the CEO of the Chamber of Commerce who supported Maza’s permit. The city council denied the permit in a 2-2 vote, with Cano recusing himself. The National City Attorney, Claudia Silva, left her position on October 12th. She was replaced by Interim-City Attorney George Eiser–the former NC city attorney for 25 years. Season 3 of FX’s American Crime Story looks at Andrew Cunanan, born in National City, who became a serial killer, murdering Gianni Versace. Cunanan committed suicide a week later. The National City-based International Community Foundation is raising funds to provide food & shelter to Haitians who have come to Tijuana in hopes of entering the U.S.
Sandra Dibble at the SD Union Tribune writes: The resources of the Padre Chava shelter and others in Tijuana have been stretched thin with the arrival of the Haitians and other migrants, and the overflow has sent some to sleep in the streets. 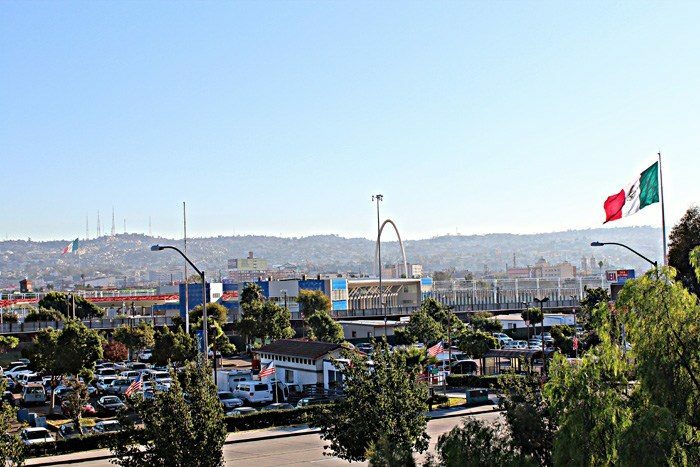 With limited capacity of U.S. Customs and Border Protection to process such large numbers, the Haitians end up waiting for days or weeks in Tijuana until their appointments at the San Ysidro Port of Entry. Shelters in Tijuana are also overflowing. IB candidates weighed in on the issue at their Candidates Forum. Beginning this week, the U.S. Border Patrol, San Diego Sector refocused its priority enforcement efforts to Otay Mountain to target cross-border criminal smuggling organizations. Mary Beth Caston, U.S. Border Patrol Information & Communication writer said in a press release, “Otay Mountain has historically been well known for bandit activity, kidnappings, extortion, and rapes committed upon migrants by perpetrators in Mexico.” You may remember my trek up there with Border Patrol a while back. This week things seem to have changed. Someone else has taken the wheel of Mr. Kinney’s campaign. Signs have been placed all over San Ysidro illegally on city and state property. By law these signs are also supposed to have campaign ID numbers in order for the public to know who has paid for them and they are nowhere to be seen. Today Board Member Linares distributed a flyer stating lies about me. It alleged that I was part of the previous administration(s). IF Trustee Linares had actually lived in San Ysidro when I worked for the district, he would know, which ALL of you know, that I wasn’t part of the Administration. I was a clerk in the district office. He insinuates that I was part of the corruption and financial mismanagement and put the district at risk of bankruptcy. I don’t understand how that could be the case when my job duties as a clerk did not include managing anything but files in the human resources department and nothing to do with district funds. The Sweetwater Authority (Authority) Board recently voted to fund $8 million of required improvements to the Sweetwater Dam. On September 28th, David Gutierrez, Chief of DSOD, said the Sweetwater Dam may be unsafe under certain extreme hydrologic conditions and stated that the DSOD may issue water storage restrictions on the reservoir if the Authority did not proceed with the necessary improvements. The required improvements to the dam include added walls and new concrete armored surfaces to the sides. The Dam was built in 1888. It’s going to be a busy two weeks with many great organizations hosting Halloween and Dios de los Muertos festivities. Suzie’s Farm kicks off their Pumpkin Palooza on Saturday October 22nd from 10am-2pm. They’ll have music, food, workshops and, of course, PUMPKINS! Owl-o-ween is at the Living Coast Discovery Center on Saturday, October 22nd from 10am-2pm. La Vista Memorial Park will also host their 8th Dia de los Muertos on Saturday, October 22nd from 2-10pm. Each year, La Vista receives more than 10,000 visitors at the event. Casa Familiar hosts a Fall Festival on Friday, October 28th from 4-7 pm on the Corner of Cypress Dr. & Blanche St. There will be games and a pumpkin patch. Casa Familiar will hold their annual Die de Muertos on Wednesday, November 2nd from 4-6pm at 212 West Park Avenue. The National City Firefighters association presents the Tower of Terror on Halloween Night, October 31st from 5-9pm. It’s free and you can find it at Fire Station 34, 16th Street & D Avenue. Hearts & Hands will hold their annual fundraiser on Friday, October 28th at 5 pm. 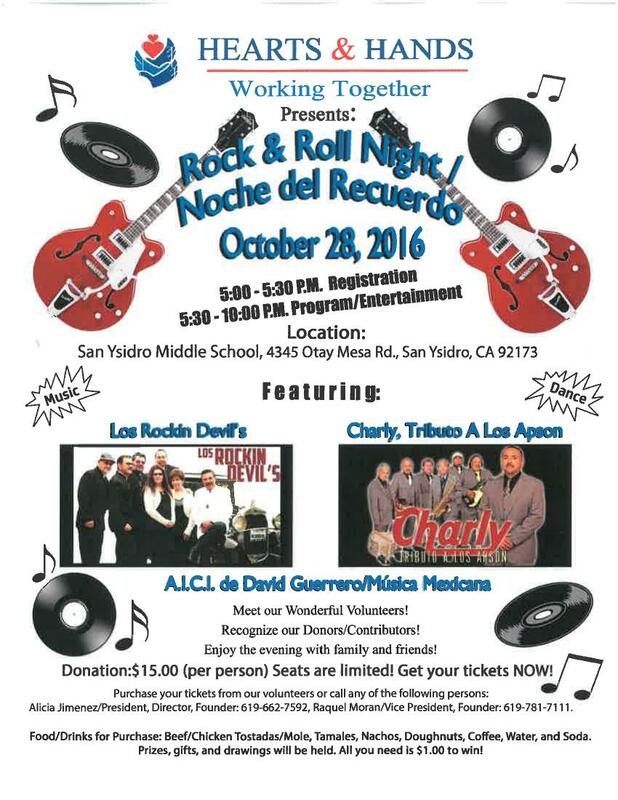 The event will take place at San Ysidro Middle School, 4345 Otay Mesa Rd. Tickets are $15 per person. For more information contact: Alicia Jimenez (619) 662-7592. And finally, here’s 9 things most people don’t know about life on the Mexican-American border. The people that showed up at the IB council meeting also showed up at the Lemon Grove City Council meeting on Tuesday, Oct. 18th. But enough others – including myself – were there to counter their racism. And there was no effort to rescind a similar declaration. I had checked out their website – the people who were organizing these show-downs at small towns around the county – and they’re “birthers” and I saw one of their posters showing President Obama dressed as a terrorist. Your reporting opens up a whole new valuable area to the rest of San Diego readers. Thank you.